Ships With: D40XT luminaires ship with a hanging yoke only. ETC Selador D40XT luminaires ship with a hanging yoke only. No lens or power cable is included. Order DPA-M bare-end to Molex adaptors separately for XT luminaires if required. Power pass-thru attaches to the next fixture using the Molex power connectors. Order power input leads separately. Your lighting doesn’t always stay indoors. You’re working outside at festivals, theme parks, video shoots, and architectural installations – and are at the mercy of Mother Nature and changing weather conditions. You require high-quality lighting products that can safely go where you go. That’s why ETC designed the Desire™ D40XT fixture. It isn’t just an ordinary LED wrapped in a waterproof body, however. ETC designed every aspect of the D40XT fixture to withstand heat, cold, rain and snow, without skimping on lighting features. The durable Desire D40XT luminaire has an IP (Ingress Protection) rating of 65, meaning that the unit’s housing completely protects the electrical components from dust, water and the formation of ice, and can withstand temperatures ranging from -20°C to 40°C (-4°F to 104°F). From coatings and seals, to vents and cord grips, the D40XT fixture’s hardware can stand up to extreme temperatures, UV rays, and atmospheric changes. And the luminaire’s attached cabling is UL Listed for extra-hard usage and outdoor ratings. ETC didn’t stop there. The D40XT luminaire offers the same brilliant lighting as the standard D40 fixture, with 40 high-efficiency emitters on each unit. The D40XT includes a user-interface with an expanded LCD display for control options. Quick Setups – General, Stage, XT (Exterior)/Architectural, High-Impact, and Studio – simplify your lighting tasks, by giving specific operating behaviors for any application. ETC built the x7 Color System™ – which combines up to seven different LED colors on one unit – into the D40XT fixture so you can take dazzling colored and crisp white light outdoors where you need it. Producing a light quality you’ve never seen before from an LED, the x7 Color System carefully balances its lighting to give you a range of adjustable color options to fit your needs. Desire D40XT color arrays The D40XT luminaire comes in various color arrays, so you can choose the mix that is the best for your specific tasks. 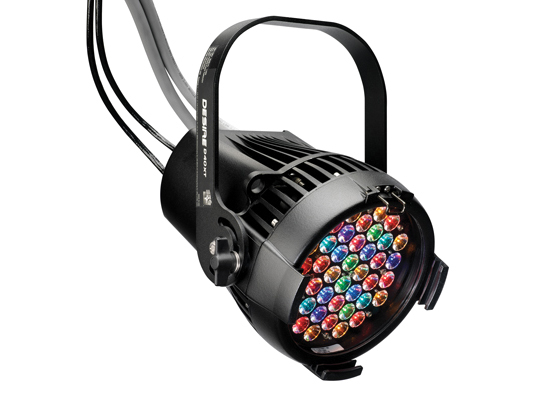 Vivid™ The Desire Vivid fixture is the high-brightness, color powerhouse of the D40XT array options. If you need deep, saturated color for your outdoor installations, choose the D40XT Vivid luminaire. Lustr®+ For beautiful, pure white light and rich color, choose the D40XT Lustr+ array. The Lustr+ luminaire – with adjustable white and tinted light – is the ideal theatrical-quality fixture for lighting talent outdoors or highlighting architectural features on building exteriors. Fire™ and Ice™ If your installation calls for daring, spectrum-specific lighting, the Selador Desire D40XT Fire and Ice fixtures are your low-power option. The Fire array’s rubies, ambers and golds, and the Ice luminaire’s sapphires, emeralds and lavenders make a bold statement for any exterior application.